We’ve come to a point in horror cinema of zombie saturation. America, 2009 is a long way from America, 1968, where civil rights and Vietnam were at the forefront. After so many years, everything derivative of Night of the Living Dead has lost any and all meaning (even Romero’s own recent output – how long will he beat that dead horse?) The only thing left to do is spoof the genre, which I suppose the new film Zombieland does adequately. But since any kind of social commentary is impossible at this point, writers Rhett Reese and Paul Wernick have taken the zombie elements and incorporated them into modern life, making them part of the background, while our geek hero tries to find himself a family and finally get a girlfriend. Yes, Zombieland is a coming-of-age story with a few zombies thrown in to decorate the scenery. Taking a cue from Max Brooks’ The Zombie Survival Guide: Complete Protection from the Living Dead and World War Z: An Oral History of the Zombie War , Zombieland‘s dweeby loner Columbus (Jesse Eisenberg, from Adventureland ) has survived the zombie apocalypse against the odds because he follows the “rulebook” which involves stuff like “Cardio” (all fat people get eaten first), “Double Tap” (zombies may not stay down on a first shot), and “Seatbelts” (a sensible rule in any situation). Naturally, by the end of the movie he’ll get the girl because of the rule that he chooses to break, which is “Don’t be a hero.” Columbus hooks up with slightly unbalanced Tallahassee (Woody Harrelson), grifter Wichita (Emma Stone) and her sister Little Rock (Abigail Breslin). (Each character names himself after the city they are trying to get to in the aftermath of the plague. However I’m at a loss why two sisters are trying to go to different locations). What do you mean I'm a zombie? Zombie, how? Zombieland goes for broad comedy, usually involving zombie slapstick. Most of the funny bits can be attributed to Harrelson, who plays Tallahassee with a good-natured vigor and manages not to take his redneck shtick to extremes. However, most of the time the screenplay tries to wring comedy out of his character’s love of Twinkies and his inability to find any. Eisenberg’s character is annoying when you first hear his voice-overs but he grows on you; the comedy comes from his bits of self-deprecation (telling the audience about his fear of clowns, inability to get laid, and his irritable bowels), various neuroses, and occasional emotional detachment when confronted with dangerous situations. I was reminded a lot of Woody Allen. The best part of the movie is the middle section where our makeshift family crashes the Hollywood pad of a famous comedic actor; I won’t reveal who it is, although you’ve probably already discovered his identity by now. There’s a lot of self-reflexive humor here, as we get to watch our heroes act out their favorite scenes with the guy from his movies. (Mystery-guest is great, as usual). The problem with the movie became more noticeable when I found myself watching the characters watching a film that is way funnier than the one they are in. As Mike Nelson said once – never show a good movie in the middle of your crappy movie. I’m not saying Zombieland is crappy, of course, but it is so very predictable. 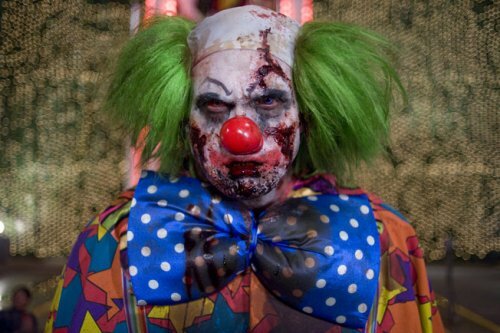 Columbus tells you that he is afraid of clowns as much as zombies, so what are the odds that his final test will be going up against a zombie clown? Are there good chances that Emma Stone’s tough-girl demeanor will be dissipated by the film’s climax, where she becomes another damsel in distress? And could it have killed the filmmakers to put our characters in serious danger? It’s no spoiler when I inform you that all four characters will walk away from this movie unharmed. Then there’s the strange lack of zombies in Zombieland – our heroes drive lonely highways and make their way through cities with hardly a ghoul in sight, and certain characters make decisions so stupid (like turning on electricity to an amusement park which would certainly attract every flesh-eating monster in the area) that I wondered how they survived this long. In its defense, the film doesn’t really seem interested in these kinds of plot-holes – it treats everything lightly, and to get laughs it just goes for all the low hanging fruit (and it’s smug while doing it). Shaun of the Dead did this better, with more wit, gravitas, and gore. In comparison, Zombieland is a teenager’s vision of the apocalypse, kind-of a Mad Max world with occasional monsters on the side of the road, dudes shooting stuff, things blowing up, and hot girls. (all admittedly cool things). It isn’t a bad film – it’s just a little lazy.